I'm going off my post-Civil War Texas one last time to commemorate the two hundred-year anniversary of the Battle of Lake Erie. You'll be reading this on September 19, but I'm writing it on the 10th, which just so happens to be the two hundred-year anniversary of Oliver Hazard Perry's victory over the British on Lake Erie. 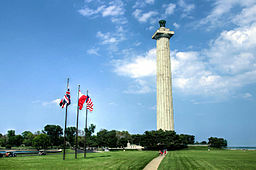 Most of you who've been to Lake Erie have seen the 352-ft. monument, but I'd like to tell you more about the battle and the commander who won it. Perry was born Aug. 23, 1785 in Rhode Island. Interestingly, he was a direct descendant of the famous medieval Scottish freedom fighter, William Wallace, and an older brother of the commodore who compelled the opening of Japan to the west, Matthew Calbraith Perry. At the beginning of the War of 1812, the American Navy was very small, which enabled the British to get a foothold over the Great Lakes and the New York waterways. 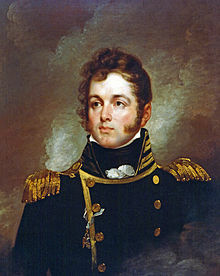 Having served in the "Quasi War" with France, where he first saw combat under the command of his naval officer father, and the Barbary War, Perry was given the command of Lake Erie. On Sept. 10, 1813, his fleet of nine ships met six British ships on Lake Erie. Perry's flagship flew the battle flag which was inscribed "Dont (no apostrophe) give up the ship," which were the dying words of his friend Captain James Lawrence, for whom the ship had been named. The battle started badly for the Americans. The Lawrence was so heavily damaged and had so many casualties-- 80% of the crew killed or wounded—that Perry and four crewman left the ship in a rowboat and rowed through heavy fire to another of his ships, the Niagara. But the British had suffered heavy casualties too, including many of their senior officers. Perry took full advantage of that and soon forced the British to surrender—the first time an entire British squadron had ever surrendered. The victory opened up the way to Canada for the American forces and protected the entire Ohio valley. Following his victory, Perry sent that famous message to General William Henry Harrison: "We have met the enemy, and they are ours. Two ships, two brigs, one schooner and one sloop." Perry earned for himself the title "the Hero of Lake Erie" and a Congressional gold medal. In all, Perry was involved in nine naval battles before and after Lake Erie, and died of yellow fever in 1819 in Venezuela, where he had gone to speak with Simon Bolivar about Caribbean piracy. He was just 34. His body was later reinterred in Newport, Rhode Island. The monument is now called the International Peace Memorial, and the United States flag flies no higher than the Canadian or British flags to commemorate the peace between our two countries. There was a reenactment of the Battle of Lake Erie on Labor Day this year, but it was not visible from shore, unfortunately. Private boaters and the ferry service "Jet Express" were allowed to get within 500 yards of it. Loved this post. Thanks for sharing! I would have loved to have been either a private boater or on the "Jet Express" to watch the reenactment. Me too, Sally! Thanks for commenting. Thank you for sharing this commemoration of the 200 year anniversary of the Battle of Lake Erie! What an interesting piece of history! Britney, thanks for commenting. It's always fascinating to hear the phrases that echoed through the centuries that have passed--"We have met the enemy and they are ours"--love that! Thanks, Susan. It was great seeing you at ACFW last week. Thanks, Maudemaxine. And I agree with you about the erosion of our present freedoms. I'm glad you enjoyed it, Sharon M! I hadn't heard about this either - thanks for the interesting post, Laurie!